A home hobbyist wanting to get into 3D printers has two choices: buy a 3D printer kit or buy a fully assembled 3D printer. The great news for those itching to stick their toes in the three dimensional water is that prices for both choices just keep dropping and dropping. There are some really great kits you can get your hands on now, such as the Makerbot, the Ultimaker, the Prusa Mendel, and others. Considering they do what most people would pretty much call magic, they are cheap in the $1,000 plus range. But now, Brook Drumm, self-professed builder of “geeky stuff,” is going to make available a build-it-yourself 3D printer named the Printrbot for just $499. But it’s not just the price that is astounding. It’s the extremely short time that is required to build the darn thing. So many of us (hint, me) would like to tinker around with a 3D printer on the kitchen table, but are all thumbs when it comes to building things. Personally, there’s no way I could spend an entire weekend with short bouts of sleep and long gulps of coffee building anything. So how long does it take to put the Printrbot together? Drumm says it took him just 45 minutes! He says it’ll take under an hour for anyone. That means I could probably do it in three hours, a project I can accept. Don’t go and clear the space off your counter though. You can’t buy one just yet. While Drumm has built his own prototype, but is not quite in production mode. However, he’s got the startup funds already pledged to him. You see, he posted his project on Kickstarter — one of the greatest sites in the history of mankind, or at least since they invented the internet — where anyone with an idea worth funding, gets funding, by way of tens of thousands of micro (and not so micro) investments made by followers of the site. You can go to Kickstarter.com to learn more. But the great news is that the Printrbot project is now funded, at the time of this writing, with $91,948 by 260 backers. Popular projects on Kickstarter often go over the goal amount (Printrbot had a goal of $25,000), and with almost a month left to go until the December 17, 2011 deadline, he could still raise hundreds of thousands of dollars more. 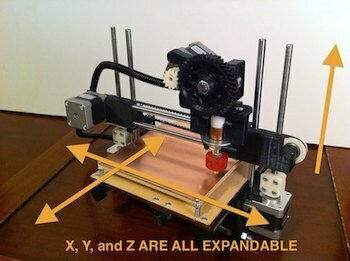 You can pledge as little as a buck to get a nice thank you on his site, or you can join what are at this time 148 others and pledge $499 and get a full Printrbot kit when ready. Spend $750 and get one delivered fully assembled. But what about the printer itself> It’s a snazzy little expandable son of a gun, but rather than have me explain everything in the video, just watch it. This project will launch a business in pursuit of the dream of “a printer in every home”. We have reduced the complexity of these printers, but will soon focus solely on pushing the price of these printers to the absolute lowest sustainable retail price for kits and fully assembled printers. Five hundred bucks is the amount many spend for a family member at Christmas. Buy one of these for someone, or yourself, instead of some junk of consumerism, and help Brook change the world.